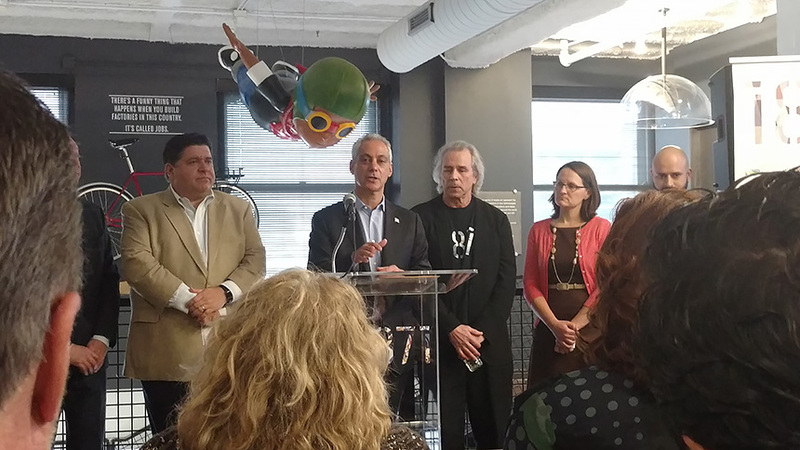 Chicago Mayor Rahm Emanuel recognized Devbridge as a force for development in the local tech sector in remarks made at the 1871 tech company incubator on Tuesday, CBS Chicago reported. A City Hall statement described Devbridge as a strategic partner to industry leaders in manufacturing, financial services and technology that’s introducing 20 new jobs to the market. Devbridge was one of 16 tech companies Emanuel commended for bringing jobs to the city, sharing the spotlight with technology leaders such as kCura (a Devbridge client), SpotHero, and others. “Today both 1871 and Chicago’s tech scene are growing, so I want to thank these companies for committing to adding jobs,” Emanuel said during the unveiling of 1871’s latest expansion. Launched in downtown Chicago’s Merchandise Mart in 2012, the experimental incubator has since grown to take over 115,000 square feet on Mart’s the 12th and 13th floors, making it Chicago’s largest co-working space.